Colour photograph of the Whitby Centennial Building on Centre Street. The Ontario County Courthouse was built from 1852-1854 on the west side of Centre Street between Ontario Street and Gilbert Streets. The architects for the building were Frederic Cumberland and William Storm of Toronto. This building was the county courthouse until 1964. 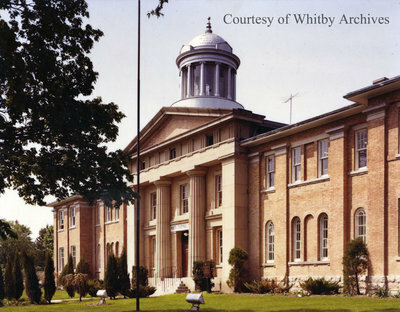 In September 1964 the Ontario County Courthouse was chosen as Whitby's Canada Centennial Project to be converted into a community centre. The Whitby Centennial Building was officially opened on February 18, 1967. A three million dollar renovation was completed in 2003 to mark the building's 150th anniversary and it is now the home of the Whitby Court House Theatre and Whitby Brass Band. Built 1852 - former County building - now Municipal community centre"
Whitby Centennial Building, ca. 1983, photographer unknown. Whitby Archives photograph D2016_004_016.